Zen Cho’s 2018 If at First You Don’t Succeed, Try, Try Again is a standalone novelette. 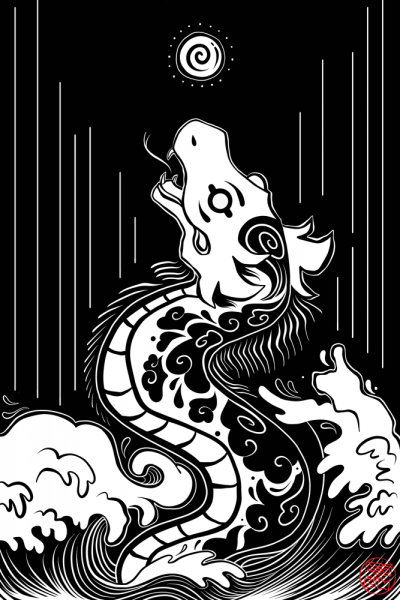 Nothing is finer than being an enlightened dragon, armed with the wisdom of the ages and a cintamani, a matchless pearl that confers godly power on the possessor. Or so believes Byam, a lowly imugi (worm). Searching for the secret of enlightenment, it is visiting terrified monks, asking them to teach it the Way. Right now!1 It is also contriving various schemes to trick heaven into granting it entry to the celestial ranks. Matters do not go entirely according to plan. Byam has not mastered the Way. Perhaps terrified monks are not the best teachers. Perhaps it’s that Byam cannot control its baser appetites. The imugi remains an imugi. But Byam does gain a deep personal knowledge of failure and disappointment over the millennia. One might expect the imugi to accept the inevitable, often public, collapse of its cunning stratagems. Alas, it does not. Matters come to head one day. Byam’s latest attempt to ascend fails, Dr. Leslie Han happens to immortalize the calamity while taking a selfie. It’s one humiliation too many. Byam sets aside dreams of transcendence for an indulgence in bloody revenge. Disguised as a celestial fairy, Byam sets out to find, confront, and kill the guiltless astrophysicist. But this too does not go according to plan…. An imugi might be seen as a larval dragon (the reviewer says authoritatively, as though it had not had to look the term up five minutes ago). Imugi can ascend dragonhood or they can fail to control themselves and wreak havoc for as long as they live. It’s easy to tell which sort of imugi one has just met: if it’s eating you, it’s the baser kind. Um, well, it might be an enlightened imugi giving you a Zen teacher whack of sorts, but that’s not likely. As was the case with last week’s read, The Man Who Bridged the Mist, this novelette was a pleasing change of pace. It’s surprisingly easy to identify with Byam, misguided as are its methods. Just as one might harbor a sneaking fondness for the coyote who always fails to catch the roadrunner. This is no dark tale of bitterness; author Cho understands that one can learn despite millennia of failure2. Because of millennia of failure.And even a short romance (as measured by the imugi lifespan) is better than none at all. If at First You Don’t Succeed, Try, Try Again is available here. 1: A good teacher strikes the match. A good student provides the kindling. At which point Huike was profoundly enlightened. 2: “Wait! What if I am successful?” you ask nervously. “How can I learn?” Know that success is often the prelude to failure on a far more epic level. Do not fret if you seem lamentably successful. Unforgettable learning experiences may even now be headed your way.